We love the Kentlands/Lakelands neighborhoods. Enjoy the Kentlands' Lifestyle! Located in Gaithersburg, on the west side..closer to North Potomac, is a wonderful walking style neighborhood community that people move to to feel closer with their neighbors, have wonderful amenities, and have close transportation/commuting opportunities. We have a new listing there, the house on the left, for $369,800. But there are lots of other houses, condos and townhomes for sale there that we could show you too. For the history and an extended article about the Kentlands/Lakelands...click here. For more pictures and information about homes for sale here and in Montgomery County, click here. I Found a Great Used Bookstore! On Quince Orchard Road, just near the corner where it crosses Clopper Rd. and Diamond in the shopping center where Magruder's is, where Circuit City just went out of business, there is a new bookstore operated by "Friends of the Library". It's an organization that supports the Libraries with donations and events to support the Montgomery County Libraries. Just to the left of Magruder's grocery store, where the old Dollar Store and Gaithersburg Pet Center used to be (before they recently went out of business) - this new store has books of all types and subjects, in good condition- some from donations, some from the libraries. And all the prices are $1, $2, or $3! For all and anything! This includes coffee table books, art, history, research, childrens, psychology, history, science, novels, nonfiction, languages, travel..the list goes on and on...and it is all arranged in easy to find subjects and authors. In addition, they have CD's, DVD's, books on tape, VHS tapes, gift books, comedy, and more. At the same great prices! You can also donate your used books to them and get a receipt for taxes for your donations. I hope you will check it out and support the libraries in our area. The profits from the stores are divided up and shared with all the libraries in Montgomery County. There are also locations in Rockville and Wheaton. 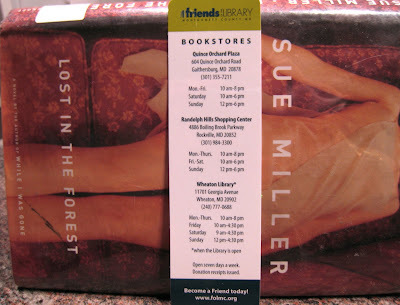 The hours, addresses and phone numbers are listed above on their "bookmark" business card. Enjoy! Open 7 days a week- unlike the libraries.